Review of a subscription box service: Swiggydiggydoo.com, based out of PA. I’m so thankful Lauren found me & sent me this initial message: “Hi! I own a new subscription box for babies and toddlers that features 3-5 eco-conscious, organic and modern products, plus a custom designed, limited edition shirt each month.” I love her motto: “ clever & fun & responsibly done”. She had just sent out her 1s…t ever box in Dec when she sent me that message, and asked if I’d be interested in a Jan box, which of course I was. 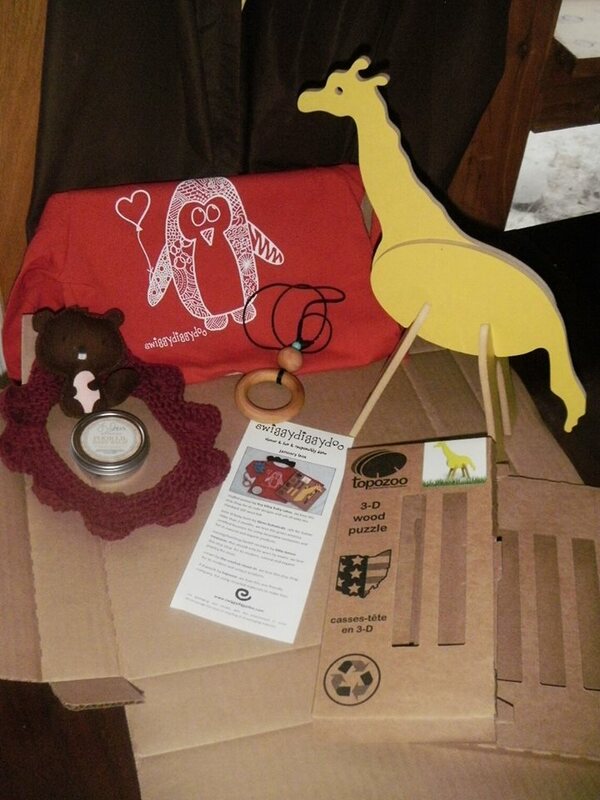 Her Dec box had featured all made in USA items (except the t-shirt which is made in Honduras, but printed in the US). She let me know she wasn’t 100% committed to US made, but would definitely be featuring many items made here. And indeed, just like Dec, the Jan box was all made here, except the t-shirt again. A box for 1 month is $39.95, which I feel is a good deal for all it contained, and the fact that it includes shipping which is never cheap. The deadline to subscribe to next month’s box is the 25th. A lot of thought goes into the packaging of each box. She selects the smallest possible box to fit the items for the month, so she doesn’t have to use any fill. She uses a local box supplier that sells recycled or previously used (and inspected) boxes. Her shipping labels, box tape and paper for the insert are all green or made from recycled products. The tape is made in the USA. The labels aren’t, but they are bpa-free and the only ones she could find that were. These are all important details to her, and to me too! Our family is thoroughly enjoying several of the items in the box! I love that the shirt is long-sleeved making it appropriate for the season, and it’s super adorable. The crocheted headband/crown is super, super cute! Unfortunately my 18m old won’t leave it on, I keep trying & have hopes she’ll get used to it because it’s just adorable. The 4 piece puzzle challenged my almost 4 year old for quite a while, he now has it figured out, but I was super happy to learn of Topozoo as a new vendor to add to my made in USA list! The felt beaver we received has been lugged around the house by my Daughter for a couple days now since receiving the box, it’s very cute! I have quite a few nursing/teething necklaces already so will pass this one on to a new Mama friend of mine who I’m sure will enjoy it! And we have another vapor rub on hand should we need it. Please, head on over & ‘like’ her Facebook page to stay on top of all the happenings, and visit her website. I’d love to know if you get a box, and what your thoughts are! If you do order, please put me, Jess, as referral. I will receive a thank you, she just likes to know where the traffic is coming from.